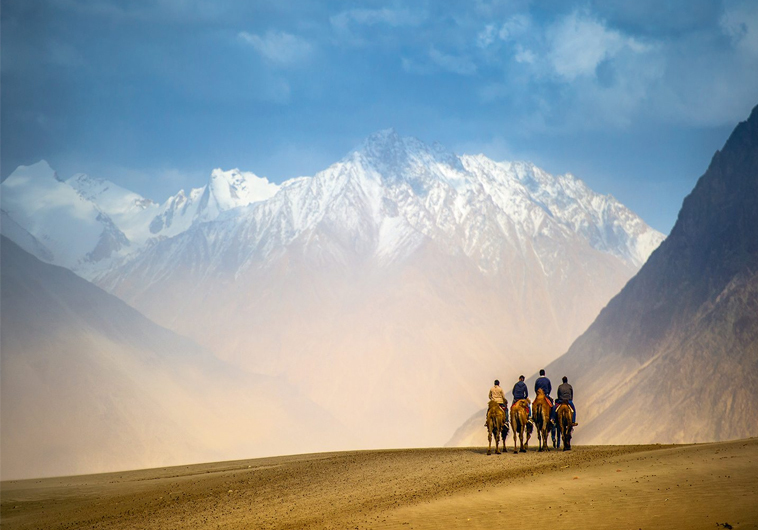 Leh Ladakh Tour – From the delightfully green meadows and forested slopes of the Kashmir valley to the austere cragginess of the cold desert of Ladakh, a trip to the state of Jammu and Kashmir is bundled with large doses of adventure and breathtaking scenery. To take on Ladakh, you need to be in excellent health and have an appetite for adventure. Rafting down the Zanskar River is counted as one of the most thrilling and exhilarating experiences by regulars, so do come equipped with wet suits and spray jackets to make the most of this trip. Arrive in Jammu in the morning. Proceed by road to Patnitop, 112 kms. Check into hotel for night stay. Scenic and peaceful, Patnitop lies at 2024 m between the Chenab valley and the Pir Panjal range on the Jammu – Srinagar route. It has good trekking routes and its snow covered slopes are perfect for skiing in winter. Trek up to Sanasar, 19 km. Gentle meadows, a golf course, and paragliding greet you there. Return to Patnitop for night stay. After breakfast, proceed for Sudh Mahadev, 10 km. This is the holy shrine of Lord Shiva, with the three separated pieces of his ‘trishul’ or trident used by him to protect his wife Parvati from a demonic looking stranger, Sudhanshu, actually Shiva’s devotee. The place derives its name from the devotee who gladly fell to Shiva’s blow. The holy month of “sawan” between mid July to mid August is highly auspicious at Sudh Mahadev. A unique feature of the shrine is the constant level of ash in the “agni kund” and water in the water kund in spite of regular burning of firewood and pouring of water over the lingam, respectively. A short distance from Sudh Mahadev is Gauri Kund, the site where Goddess Parvati bathed before her prayers every morning. Approx 60 km is the Mansar Lake enclosed by pine covered hills and known for the Sheshnag temple on its banks. Return to Patnitop hotel for overnight stay. After breakfast, depart for Srinagar, 280 km in 7 hours. After breakfast, take a city tour. Srinagar, within the Vale of Kashmir, has one of the loveliest locales of the world. Towering peaks of the Pir Panjal ring the lake-dotted valley, and rice fields, meadows, gushing streams and flower-bedecked gardens add to the beautiful landscape. The city’s attractions include the Shankaracharya temple on a hill which affords a splendid view of the city; the Hazrat Bal mosque, the gardens of Nishat Bagh and Shalimar Bagh, and the lovely Dal, Nagin, Wular and Manasbal Lakes. Depart early for Gulmarg, 60 km/2 hrs. The drive to Gulmarg is lined with poplar trees, rice fields and dainty hamlets. Poplar gives way to fir after Tangmarg, and the views of the snow capped mountains are breathtakingly beautiful. Gulmarg is synonymous with softly rolling meadows in summer and skiing slopes in winter, and is referred to as the “meadow of flowers”. It also has the highest golf course and the highest cable car in the world. After lunch, proceed to Pahalgam, 140 km/ 4 hrs. Pahalgam is popular for golfing, angling, trekking and pony rides and is also the base for pilgrims to the holy shrine of Amarnath. Depart early for Sonamarg, the “Meadow of Gold”, 84 km, 2730m across the Sindh River. Here the snow capped slopes are much closer, and you can take to tobogganing even in summer on the Thajiwas glacier. Sonamarg is off the Leh-Srinagar highway and also a base for treks to Amarnath and the lakes of Kishansar, Gadsar, Satsar and Gangabal. Return to Srinagar for night stay. Depart early for Leh, 434 km on the Srinagar – Leh highway, open between June and November. The Leh-Srinagar highway is a fantastic journey from the verdant slopes of the Kashmir Valley to the stark barrenness of the Ladakh districts. The Zoji la pass at 3505 m marks the boundary between these two geographic regions. The road passes through Drass, Kargil, into the secluded Zanskar range, Pashkyum, Mulbek, Namika la, Fotu la, Lamayuru, and finally to Khalatse by the banks of the Indus. Ladakh is culturally and physically very different from the rest of Jammu and Kashmir, and comprises the two districts of Leh and Kargil. Predominantly Buddhist, Ladakh has greater cultural affinity to the Tibetans across the border. The extremes of climate demand a day or two for acclimatization, though the journey by road prepares you partially for the extreme conditions. Day at leisure and rest in Leh. After breakfast, you may rest, or proceed on a local sightseeing tour. Its attractions include the 17th century Leh Palace, Temple of Mangyal Tsemo, Spituk, Stok Palace and Monastery, Shey Palace and Monastery. At some distance away from the town are the Phyang, 17 km, Thiksay 18 km, Stakna 25 km, Matho, 26 km, Hemis, 47 km, Chemday, 40 km, Thaktok 46 km and Basgo, 42 km. North of Leh, the Nubra Valley can be accessed through the Khardangla Pass at 5600 m, one of the highest motorable roads in the world. Several Buddhist gompas can be visited enroute. Overnight stay in Diskit guest house. Depart for Panamic hot sulphur spring in the morning and visit the Sanstalling and Sumur monastery. Return to guest house for lunch and proceed to Hunder in the afternoon. Return to Diskit for overnight stay. After breakfast, return to Leh, 118 km. Depart early for Lake Tsomoriri, 240 km from Leh. Tsomoriri is an 8 x 28 km wide pearl shaped lake at a height of 4525 m habitat for a large number of bird species. The Korzok Gompa is situated on the banks of the lake. Stopover at Chumathang sulphur spring, and monastery, 140 km from Leh. Further along the road, visit the Sumdah village. Spend night here in tents. Visit the Korzak village and gompa and walk around the highest barley fields in the world. Early morning, proceed to Mahe village and up to Puga valley. Road winds past Polokongka pass at 13,500 ft to reach Tsokar Lake and Thigke gompa. Look out for the herds of wild asses here. Continue drive up to Leh Manali highway, through the Tanglangla pass at 5350 m, the second highest motorable pass in the world. Proceed to Kargil 183 km by road. Drive past impressive Fotu La, 14,000 ft, a high mountain pass between the Indus valley and the Suru valley. Halt at the Lamayuru monastery, one of the oldest monasteries amongst the ‘Red Hat’ sect. Zanskar is 220 km south of Kargil, with a partially paved road for a distance of 40 km. The road is open from the middle of July to early November. It is a 5000 sq. km large mountainous terrain sandwiched between the Zanskar and Great Himalayan Range. The Stod and Lingti – Tsarap rivers meet to form the Zanskar river, supporting a 14,000 strong Buddhist population. Proceed to campsite at Rangdum, , with views of the Nun and Kun massifs, glaciers and meadows over 7000 m.
After breakfast, drive to Remala for the first lap of the rafting trip, past the Pensi – La at 14,500 ft. Enjoy the breathtaking views of the Zanskar peaks and the Drung Drang glacier. After breakfast, raft from Remala to Padum, near the Karsha Gompa. This river stretch is a class II section. Spend the afternoon trekking to the Karsha gompa for the evening prayer session. After breakfast, raft from Padum to Pidmu for 30 km. This is a grade II and III section. Settle into the camp at Pidmu. Rest of the day, visit neighbouring villages of Pidmu and Hanomil. After breakfast, raft to Neyerak, 20 km. This is a Grade III section. Overnight stay in Neyerak village. This alternates between Grade III and IV, the water gushing through narrow gaps, especially at the confluence with the Markha River. Another Grade III/IV section along the 40 km stretch. Your cascade down the Zanskar ends 25 from Nimu at Alchi over Grade III and IV rapids. Rest awhile and then walk up to the beautiful Alchi monastery. Drive back to Leh, 67 km. Check into hotel for overnight stay. Check out of hotel in time for flight to Delhi.